Welcome to Hemlock Hills in beautiful Gatlinburg, Tennessee. These cabins are between one and five bedrooms and can accommodate up to eighteen adults comfortably. Amenities for the cabins include wifi, washer, and dryer, large deck with forestry views, fully equipped kitchen, large dining area that can sit up to sixteen people. 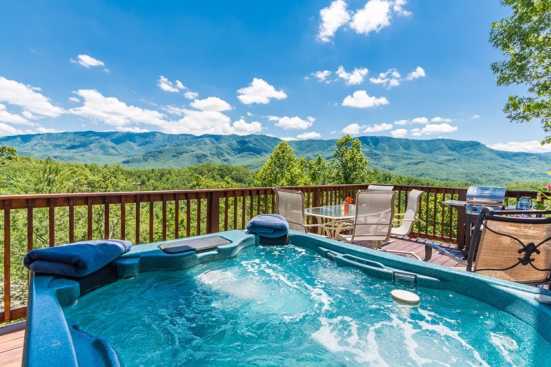 Located just five minutes from downtown Gatlinburg and just a little further away from Smoky Mountain National Park there are endless opportunities for fun and adventure. Smoky Mountain National Park boasts some of the most scenic mountaintops views in the country as well as some of the most unique wildlife. The park offers a variety of guided tours including hiking to hidden waterfalls, freshwater fishing tours, and white-water rafting. If a leisure day of relaxing and shopping is more your style downtown Gatlinburg is the place for you. With hundreds of unique boutique style retail outlets, downtown Gatlinburg is a shoppers paradise. These retail locations sell everything from handmade leather goods to blown glass and Indian arrowheads. Gatlinburg also has a wide array of museums to explore and great theaters offering dinner and a show. SmokyMountainByOwners.com is the best place to plan and book your online vacation in Gatlinburg, Tennessee. From traveling through the mountains (on foot or in a boat) to becoming one with nature Smoky Mountain Park will truly be a vacation you won’t forget. SMBYO.com aims to take the stress and hassle out of planning and booking your Eastern, Tennessee vacation. All you must decide is do is whether to traverse Smoky Mountain National Park by foot or boat.